Good content that resonates with the receiver will generate more leads and will increase opportunities for conversion. One of the best ways to conduct content marketing is by refreshing website content with frequent blog posts or to even publish a guest blog on someone else’s website. Here is the rundown of how content marketing works. Content marketing is the strategic use of various forms of online content to attract, engage, and convert customers. This modern approach to marketing is not a one-way street. This is what makes it so different from traditional modes of marketing like television commercials, billboards, and mailed marketing materials. Instead, content marketing takes on a reciprocal approach where a company shares information with followers. If the content is top-quality and relevant, followers will respond to it. Their responses could include comments, questions, likes, follows, or direct sales depending on the type of content and how it is presented. Content marketing largely works by sharing amounts of information online that impresses those who read this material. Good content consists of thoughtful information that is grammatically correct, error-free, and relevant to the core audience. This is another thing to keep in mind—the best content is written with the audience in mind. 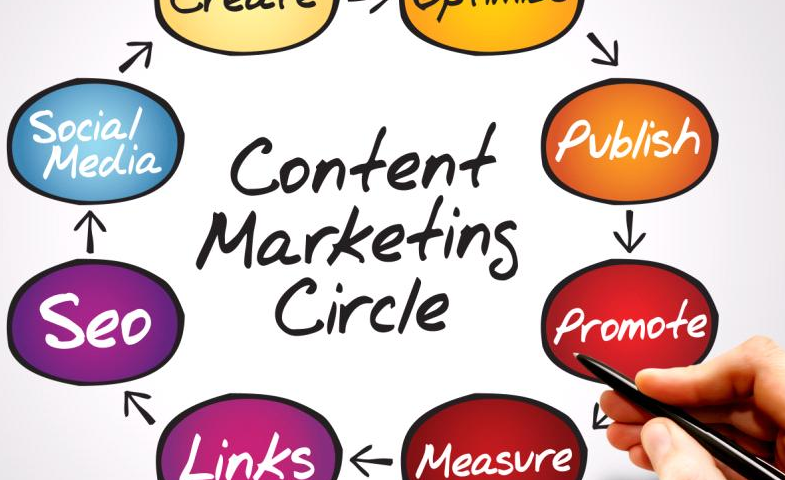 While content marketing consists of two steps (the actual content and the act of marketing), this should not be misconstrued with writing content simply for the benefit of the company. On the contrary, good content is written to foster relationships with those who may eventually come to know, like, and trust the brand. The best content will take a more passive approach instead of being overtly sales-oriented. This will be an approach that provides solutions to people’s most pressing concerns and it will be meaningful to them as they search for information online without being overwhelmed by constant messages to buy, buy, buy! While there are various forms of digital content including social media posts, e-books, newsletters, infographics, and videos, blogs stand out as a top contender when it comes to content marketing. Blogging is a highly effective means of sharing content with online followers. Blogs can come in the form of articles on the business’s website or they may be guest blogs on other company’s websites. No matter the approach, an insightful blog article that expounds on a topic of interest is an excellent way to meet the needs of a business’s core audience. Blogs can consist of how-to material, suggestions, unique points of view, explanations of industry trends, and can take many other directions, all for the benefit of the blog’s readers. Blog content is an excellent way to market and display the expertise and industry insight of the blog’s writer. Another important aspect of content marketing is search engine optimization (SEO). SEO means the optimization of a website according to the current best practices of Google and ensures that the site will rank higher in search results. The content that you publish should be optimized according to current best practices as well. This means that when someone goes on the internet and types keywords in their search bar to locate information, only those websites that closely match these search terms will appear. This is why content marketing should always include SEO for the best results. When blogs are written for SEO in mind, these articles can help to boost a website’s traffic and improve visibility for the brand. For those who are interested in writing a guest blog post, the same rules apply. Even though the blog is posted on an outside website, the more views the posts receive, the more opportunities there are to gain new customers. This is truly a win-win situation. Keep these helpful tips in mind when it comes to achieving content marketing success. Today’s businesses can position themselves as authorities within their industry, they can gain valuable exposure for their business, and they can help people solve their most pressing problems by sharing content that is relevant and valuable to them. To learn more about the ins and outs of content marketing, contact a team of content marketing specialists today for more information.